THE IRISH Banshees and the Danish Vikings took the honours at this year's Euro Cup in Cork, Ireland. 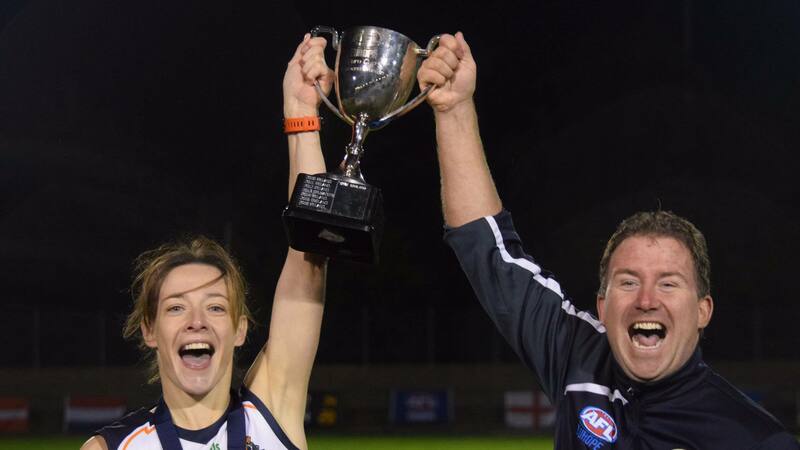 The Banshees, women's champions at last year's AFL International Cup in Melbourne, were keen for retribution after their loss to the England Vixens in last year's final in Bourdeax, France. They set up a tantalising rematch by accounting for Croatia, Scotland and France in the group stages, before toppling Sweden in the semi-final. The Vixens kept up their end of bargain by thrashing Croatia in their semi-final. An increasingly parochial home crowd revelled in the prospect of an Irish double, and the Banshees fed off that atmosphere to put England to the sword from the word go, running away to win by 25 points and securing their third Euro Cup title. With the first leg of the potential double in the bank, attention turned to Ireland's men. Despite a typically spirited performance from the Warriors, the Vikings kept the home nation at arm's length for the duration of the contest. The Vikings were impressive in their return to the competition after missing the 2017 carnival. They had a convincing win over defending champions, the England Dragonslayers, in a semi-final, before the 14-point victory over the Warriors. It was Denmark's first Euro Cup title since 2015, and based on its performances this year it would seem unlikely it will have to wait as long to secure another piece of silverware. The Vikings set an impressive standard for other European sides to match. Some 400 players represented 24 teams from 15 nations in women's and men's competition at the Cork Institute of Technology. The Irish chill and persistent rain did nothing to dampen the spirits of the crowd. Although the traditional powerhouses from England, Ireland, Croatia and Denmark were expected to make waves, the early highlight came in the women's competition when the German Eagles – making their Euro Cup debut – triumphed over the Danish Valkyries to secure their maiden win. The German players' enthusiasm upon hearing the final siren typified the spirit of the event, with the progression of the developing football nations noticeable for all in attendance. Small gains were celebrated as heartily as any of the key wins by those at the top end of the draw. The tournament marked the start of a jam-packed 18-month international cycle for European players, encompassing the 2019 Euro Cup in Norrtålje, Sweden, the full-scale 18-a-side European Championships in London, and the 2020 AFL International Cup in Melbourne. The Euro Cup, run by AFL Europe, was one of several Australian Football carnivals played across the world last weekend. In Kuala Lumpur, Malaysia, the Indonesia Volcanoes beat the Philippine Eagles in division one of the men's AFL Asia Asian Championships, the Papua New Guinea Muruks accounted for the Thailand Tigers in division two, and the Vietnam Swans defeated the Hong Kong Dragons to claim the inaugural women's title. In Franksville, Wisconsin, the Austin Crows held off the Golden Gate Roos to win the men's division one title at the United States AFL Nationals, while the San Francisco Iron Maidens were too good for the Seattle Grizzlies to capture the women's crown.